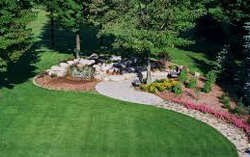 STI Landscaping is a full service landscaping company based in Regina and serving Regina and surrounding areas. With our long-standing reputation and experience, we are ready to tackle any type of outdoor project. We stand behind all our products with confidence and the assurance to transform your vision of a beautiful yard into a reality. We are a trusted company within the community, so you know when you hire us you will get quality service and 100% customer satisfaction. Your outdoor project will be completed in a timely manner and on budget with no hidden surprises.We communicate honestly with our clients to create a positive environment while we complete your outdoor vision. Synthetic Turf International Canada (A division of STI Landscaping) is Saskatchewan's exclusive distributor of the STI products. STI website: sytheticturf-sask.ca. Our superior line of high caliber synthetic turf products will help you transform your yard into a no hassle, zero maintenance paradise. We only supply premium materials along with extensive installation experience to complete your project from the ground up. Let us help you create a wonderful yard that allows you to sit back and enjoy the seasons hassle-free, without any ordinary yard work.